Kathmandu is the greatest city of the Himalaya, a unique survival of cultural practices that died out in India a thousand years ago. It is a carnival of sexual license and hypocrisy, a jewel of world art, a hotbed of communist revolution, a paradigm of failed democracy, a case study in bungled Western intervention and an environmental catastrophe.Closed to the outside world until 1951 and trapped in a medieval time warp, Kathmandus rapid modernization is an extreme version of what is happening in many traditional societies. The many layers of the citys development are reflected in the successive generations of its gods and goddesses, witches and ghosts, the comforts of caste, the ethos of aristocracy and kingship and the lately destabilizing spirits of consumer aspiration, individuality, egalitarianism, communism and democracy.Kathmandu follows the authors story through a decade in the city and unravels the citys history through successive reinventions of itself. Erudite, entertaining and accessible, it is the fascinating chronicle of a unique city.Quote of praisesA narrative of an enchanting and troubling complexity. 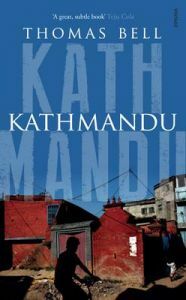 Tom Bell has thought through the history and contemporary reality of Kathmandu and has written a great, subtle book, one as shadowed as Kathmandus alleys and as brilliant as its midday squares - Teju Cole, author of Open CityA wonderfully discursive account of the personal discovery of a great city. Looping through centuries and slaloming between journalism and history, memoir, mythology and gossip, Tom Bell has written a portrait of Kathmandu like no other, taking us from Manjushree to the Maoists via witches, colonial Orientalists, LSD cults, spies wars and old Serge Gainsbourg movies. A splendidly eccentric and enjoyable first book - William Dalrymple, author of Return of a KingAn evocative and entertaining portrait of a misunderstood city - Sam Miller, author of Delhi - Adventures in a Megacity and Blue Guide IndiaCapturing the complexity of Nepali-lived experience, this is an exquisite read - Manjushree Thapa, author of Forget KathmanduAbout the AuthorThomas Bell was born in the north of England in 1978 and studied at Oxford and the Courtauld Institute of Art. After university he moved to Kathmandu to cover the civil war in Nepal for the Daily Telegraph, The Economist and other publications. He was the South East Asia correspondent of the Daily Telegraph before returning to Kathmandu, where he lives with his family.